For Donald Capoccia, the developer behind 11-17 Second Avenue — the new apartment complex to be built on the current site of Mars Bar — the project is a return, after a decade away, to the East Village — the neighborhood where he launched his career and where he left his mark during the gentrification of the late 1990’s. BFC Partners, Mr. Capoccia’s company, was responsible for the construction of hundreds of units of affordable housing in the East Village at a time when property values in the area were taking off. But the firm also became mired in a bitter dispute with residents over the destruction of community gardens to make way for Eastville Gardens, a mixed income development on Avenue C between East Seventh and East Eighth Streets. Despite some rumblings over the loss of Mars Bar, a relic of the rough-and-tumble East Village of the 1980’s, the reception for the current project could hardly have been more different. In the past decade, the neighborhood has changed dramatically: when the 12-story building rises, it will stand among the much larger Avalon development on East Houston and Bowery. So far, BFC’s plan is going smoothly and Mr. Capoccia stands by his record. John Vaccaro, who lives above Mars Bar, has made peace with its imminent closing – and the loss of his home – and is prepared to move on. When John Vaccaro’s loft is torn down this August he will not be sad. When asked what he will miss, “Absolutely nothing,” is his immediate response. Mr. Vaccaro is one of four tenants, in addition to the Mars Bar and Joe’s Locksmith, being pushed out of 11-17 Second Avenue this summer as the building’s owner, BFC Partners, moves ahead with plans to build a luxury high-rise. Mr. Vaccaro came to New York in 1961 and enjoyed a successful career as a theater director. Back then, he says, “We all knew each other,” referring to the artists and musicians — Andy Warhol among them — that roamed the East Village in its bohemian heyday. Now, looking down from his fire escape just above Second Avenue, Mr. Vaccaro says that those days are gone. Mourning A Loss Beyond Mars Bar from Tania Barnes on Vimeo. John Vaccaro, a theater director active in the downtown arts scene of the 1960’s and 1970’s, has lived in his sprawling, bespoke loft on Second Avenue for several decades. The vast space is filled with artwork from local friends – including various portraits of himself that Mr. Vaccaro has received as gifts – furniture and other odd items found around the East Village over the years. If the project, which was endorsed by Community Board 3 last week, moves forward, Mr. Vaccaro’s building, 11-17 Second Avenue, will be one of two torn down to create a single 12-story building. The project will also force the temporary closure of the landmark Mars Bar, which is also on the site. Current residents will be offered units in the new development with an option to buy for just $1. But those living in 2,000 sq. ft. lofts like Mr. Vaccaro will have to adjust to downsized apartments closer to 1,200 sq. ft. Even as many in the neighborhood have lamented the loss of Mars Bar, Mr. Vaccaro, who is 81, stands to lose far more: his home. NYU Journalism’s Tania Barnes and Stephanie Butnick report. Stephanie Butnick The housing committee of Community Board 3 approved a plan to renovate a string of properties at 9 and 11-17 Second Avenue. The next step is a vote by the full community board Dec. 21. The housing committee of Community Board 3 tonight endorsed a proposal to renovate a string of properties along a stretch of Second Avenue and turn them into a new mixed-income development. The move also brings the temporary closure of the iconic Mars Bar, which is located on one of the properties, a bit closer to becoming a reality. The bar, a fabled East Village haunt, would likely remain closed for the two years it will take to renovate the property. 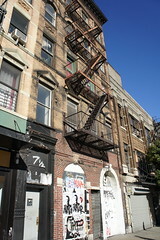 Representatives from the project’s developer, BFC Partners, and the Urban Homesteading Assistance Board explained the project, which would rebuild properties at 9 and 11-17 Second Avenue – currently in various states of disrepair and in some cases, code violation – into a single 12-story building offering both permanently affordable housing and market-rate units. The existing tenants of both buildings will be offered space in the new building – with the option to buy the new apartments for $1. A low fee to be sure, but – under the terms of the renovation agreement – the apartments will never be allowed to be offered at market rate (the re-sale price for the units is about $180,000). Not all tenants are as optimistic as Ms. Green. John Vaccaro, a resident 11-17 Second Avenue for more than three decades who did not attend the meeting, told The Local afterward, “I don’t support them taking down what should be a landmarked building.” And, at 81, he is not keen to be relocated for the roughly two years it would take for the project to be completed. Nevertheless, the committee voted to recommend the project, with one committee member abstaining – Val Orselli of the Cooper Square Mutual Housing Association declined to vote, citing a past professional relationship with the developers. The next step is a Dec. 21 meeting, where the full Community Board will vote on the project. Stephanie Butnick The buildings at 9, and 11-17 Second Avenue, which will be renovated as part a new development featuring low-income apartments that would be available for as little as $1. Developers are expected to seek Community Board approval Wednesday for a plan to renovate a row of properties along Second Avenue, and sell some of the apartments to low-income families for as little as $1. The mostly low-income families who currently live in the two buildings at 9 and 11-17 Second Avenue are guaranteed units in the proposed development, which would combine the two structures into one larger building. The project, run by development firm BFC Partners, is operating under the Department of City Planning’s 2009 amendment to the inclusionary housing program, which creates permanently affordable housing, now with the option to buy. According to Juan Barahona of the development firm, tenants will be able to buy the new apartments for between $1 and $10. The project will also take advantage of new zoning laws that allow developers to build more square footage on a lot, provided they allocate 20 percent of the building’s total area to affordable housing. In this case, the 12-story, 4,000 sq. ft. building will house approximately 12 low-income units (available to those making 80 percent or less of the area’s median income ̶ approximately $63,000), dispersed throughout the complex, and about 48 market rate units. The development’s market-rate units, which make up the majority of the building, will offset costs.